Hoping you guys can help me I.D these old knives. When my Grandfather passed a little over 15 years ago, I inherited a lot of his things. These 3 knives were in with his stuff. They're old as heck, that's about all I know about them. I'll describe them as best I can. I'm convinced that the two lighter handled ones are either bone, ivory or one of each. They're all about 5" O.A.L. The top one has a very mellow, yellowish tone to the handle and it's very smooth. It has a fine looking darker grain running through it that isn't really apparent in the picture. On the tang it says "KB Extra" and on the opposite side it says "Germany". I know KB is a fairly common knife, but I've not been able to find anything about one that looks like this one. The middle one has no markings on it at all. The handle is much lighter in color and also has a very fine grain to it. Even finer than the top one. It's definitely hand carved and has a trough carved into it around the edge of the handle. Here's a picture of that. The last one is a bit different. The handle is made of Ebony, and I only know that because it says so. It's stamped "Real Ebony" and below that it says "France". There's no other markings on the blade or tang. So that's all I know about them. I hope you guys can help me. I keep the Ebony handled one in my BP box and use it to clear the occasional cap jam. It's pretty handy for that. Thanks in advance for the help. My thoughts too. Could also be Veterinarian tools. Looks like turn of the Century vintage. (1900 not 2000). Wow, really guys?!?! You think so? I never even thought of that. They're handy little devils for certain things. I use the black one mostly. The other two sit in my box with all my other knives. I had no idea they were that old. I guess it kind of makes sense. My Grandfather was born right after the turn of the century. They could have belonged to his father I suppose. He was an Italian immigrant, so the fact that one is from Germany and one from France makes a little more sense. His father could have brought them over with him I suppose. Thank you Mike. 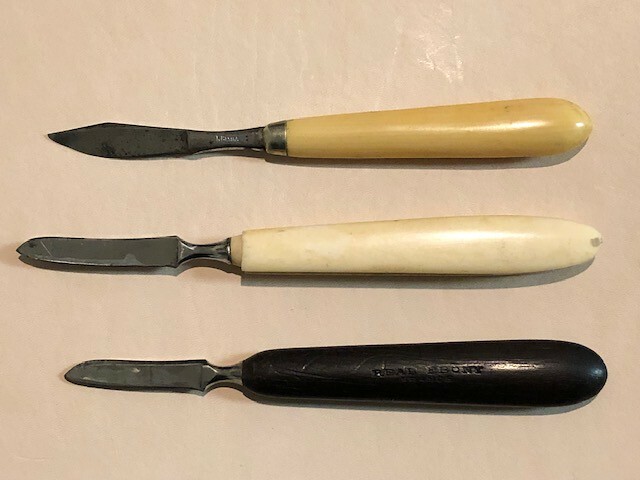 I just learned a lot about antique scalpels! At least now I know what they are. I also have another one that looks like a miniature straight razor. There's a picture of one like mine on the one website. It's pretty neat too. It even has a tortoise shell handle. 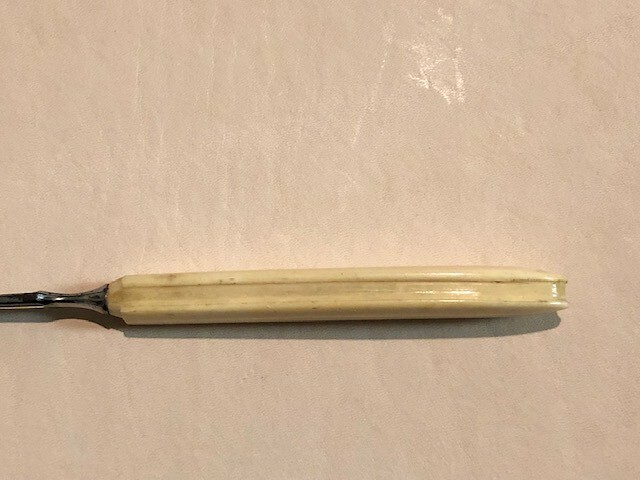 The website says it's a Civil War era folding scalpel. I just wonder what my Grandfather was doing with a bunch of scalpels!